In the first part of “ Image editors for the rest of us,” I covered two programs at opposite ends of the spectrum. One newly released image editor, Acorn, doesn’t go for flash or overloaded features, but its simplicity means that it does its tasks very well. Pixel, on the other hand, tries to do everything, but in my opinion, it fails at an unacceptable number of tasks. For me, the sweet spot is Pixelmator, which was just released this week. Pixelmator, developed by brothers Saulius and Aidas Dailide, is a fantastic layers-based image editor that uses Apple’s Core Image to work much of its magic. With over 20 selection tools, 15 color-correction tools, 50 filters, and support for over 100 file formats including PSD, TIF, JPG, EPS and PDF, Pixelmator is poised to fill the void between high-end Photoshop and streamlined editing applications like Acorn. The obvious comparison is, of course, to Photoshop. With full support for layers, blend modes, gradients, brushes, metadata and ColorSync, it’s hard not to compare Pixelmator with Photoshop. But I really think it should be compared to Adobe’s Photoshop Elements, if anything. Because Pixelmator doesn’t yet support CMYK color spaces, Camera RAW formats, drop shadows or any of the other layer effects found in Photoshop (all of which are on the slate for future releases, according to the developers), you can’t really expect to use it on a professional level day-in and day-out. But, in my three-week test of Pixelmator, I was blown away with its features, speed, stability and utterly stunning good looks. Some cool things that will surely get overlooked at first are Pixelmator’s support of Apple’s Automator technology—in the form of actions for resizing, converting, enhancing, running filters and more. Full drag-and-drop, Spotlight, iSight camera capture and iPhoto support are also built-in. I really loved the Photo Browser’s ability to find my iPhoto pics inside my Events, Smart Albums and photo library and be able to open them virtually instantly. Unlike many other image editors I’ve looked at, Pixelmator had no problem at all opening very large images (50MB images were no problem at all). Just for grins, I also installed it on my ancient 500MHz G3 iBook with 256MB of RAM. As expected, working with high-resolution images is completely out of the question, but when working on smaller images for the Web, Pixelmator performed well enough to remain installed and in the dock for those times when I’m in a crunch and away from my Mac Pro. The only flaws I came across in Pixelmator’s glossy black and lusciously-opaque interface is the decidedly out-of-place use of Apple’s built-in Color Picker and Font Palette. Another glaring hole in Pixelmator is the lack of a full complement of keyboard shortcuts. If you don’t need to work in an image editor all day long, this shortcoming is probably easily overlooked. And finally, I could not figure out why they chose to use .jpeg instead of .jpg as a file extension. This requires an extra step for me to convert the name, since many Web servers don’t recognize the .jpeg extension. Pixelmator certainly isn’t for everyone, but, in my opinion, it could easily be for many of us, especially if it evolves quickly and smartly. 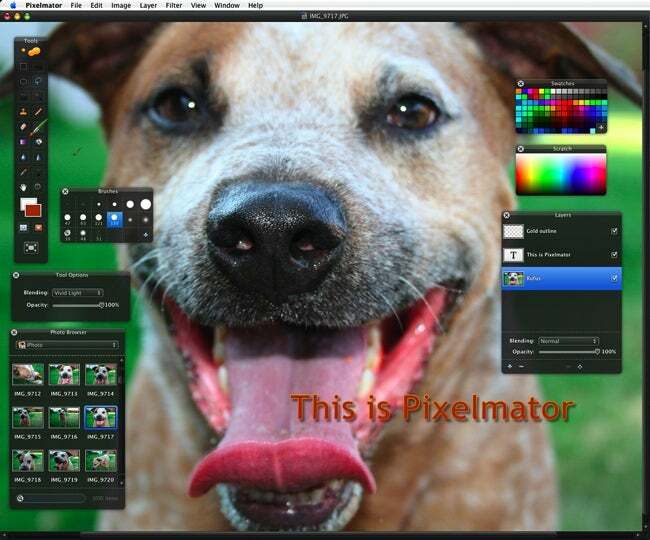 For a Version 1.0 product, Pixelmator is already better than any other image editor outside of Photoshop, and that includes Photoshop Elements. With the developers already working on adding more features, and a very reasonable $59 price tag, it has the promise to join programs like Panic’s Transmit, St. Clair Software’s Default Folder and Titanium’s Software’s Onyx as Mac user favorites. For pixel artists such as icon designers, you’ll certainly be interested in giving Pixen a try. Pixen, another great freebie is also perfect for making Web site favicons and low-resolution animated images.